If you want to suffer pain after a 5 day water fast, eat a big greasy hamburger. It will land in your stomach like a brick and take 2 days to digest during which you will suffer intense pain. Fasting increases your body’s ability to utilize food. The colon wall is clean of mucus coating, allowing the full absorption of nutrients and the digestive organs to be fully functioning. After a fast, the body is more efficient in digestion and absorption of nutrients. For this reason, underweight people, due to impaired digestion, will gain weight after a fast. For a person who has lost weight through fasting, returning to the North American Diet can cause rapid weight gain. To keep the weight off, your fast should usher in a drastic change of diet. 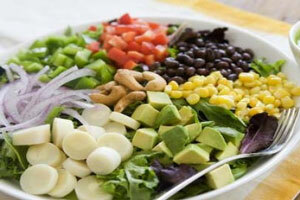 When your diet is mostly raw fruits and vegetables, you will be removing toxic fat, sugar and refined starches. Your body gets fewer calories and more nutrition. Exercise is a vital part of this equation. Exercise increases base metabolic rate. When you exercise, the muscles use their glycogen reserves for the workout. For several hours after the workout, your muscles are reabsorbing calories from the blood to replace the glycogen reserves. Healing and vitality will deteriorate on a diet high in starch, sugars and fats. You also will become aware that spiritual focus and discipline are affected by a poor diet. Eating healthy takes education, experimentation and some time for adjustment. You have to test what diet works for your lifestyle and unique metabolism. It took years to get my diet to where I wanted it. Now it is easy. I drink fresh veggie juice for breakfast followed by fruit shakes blended with ice and Sucanat. About 2 hours later, I eat frozen, banana slices over fresh fruit and sprinkled with Sucanat. For dinner, I eat green leafy salads with fish using flax seed oil and spices for dressing. I eat yams and cooked vegetables occasionally as a treat but find them heavy. I avoid starches, dairy products, chicken and meat but I am not strict or legalistic about eating and occasionally eat something totally off track like ice cream, but because 99% of my diet is healthy and I exercise, it has little effect except to clog the sinuses for two hours. The first reaction to smoking a cigarette is nausea. If you keep smoking the body will become immune to its poisonous effects. After a fast, a clean body becomes like a thermometer to these harmful foods, no longer immune to their poisonous effect. Your body is clean, and has far less tolerance to the poisonous foods that you were used to eating previous to the fast. The sick feeling you will get from eating poison is a sign that your body is functioning normally. I remember the one piece of apple pie that totally eliminated all the amazing feelings of health and well-being of the fast. After five minutes in my stomach, I was back to my old state of life. Thirty minutes later my sinuses clogged and my head was foggy. My emotions lost that childlike freedom I had become used to. I then realized that the elation of fasting is totally dependent on the blood being clean. The fact that these good feelings can disappear so quickly verifies, in dramatic fashion, the toxic nature of the Modern Diet and its effects on our state of well-being. A lifetime of eating these adulterated foods has destroyed healthy sensitivity.The cleansing of this waste through fasting has allowed this sensitivity to return.The cleaner you become, the more you will be able to sense both the good and bad effects of various foods. This is the way it should be. A healthy body has a sensitivity that teaches us what we should and shouldn’t eat. Chocolate tastes sickeningly sweet. A hamburger is heavy in the stomach, digests like a rock and makes the skin greasy. Pizza clogs the sinuses for two days. Meanwhile, a cantaloupe digests with ease without any negative effect and feels good. Having a healthy body may limit your ability to tolerate what you were previously free to indulge in, but the limitation is a blessing. You’ve walked a hard road to reach your goals.Do not allow your emotions to disrupt the logic and discipline that has brought you this far. Well all of the comments were right on it being harder to quit the fast than to eat nothing at all. I did it though! A few times I almost gave in to what foods “I wanted” but then I got to thinking about how bad my stomach would feel if I did. My question is concerning the weight gain though. yet I have already gained 5 pounds. When I start to get discouraged I really think about all the chains that I did break during the fast–but I still would like to keep loosing the weight. Any suggestions?? I haven’t even been back on the scale b/c I know I’m eating healthy–and I have been riding my stationary in the mornings. I did start tracking my food again–and I’m eating less than 1200 calories–some days only 400 or 500 when I eat mainly fruit. Is my body only putting on weight for a short time b/c I’m eating new foods–I’m hoping I will start loosing again, even if its a slow process. The body puts on weight after a fast as to colon refills and the body retains more water for digestion. Boil the chicken and pour of the fat before you grill. You are doing good and be pleased with the results. Gerson Therapy says only a Norwalk fruit press should be used for fasting. I have used ordinary juice seperators in the past. I do try and not let the juice stand for too long. Norwalk presses are hard to get hold of down here in Venezuela. Please opine. Its a juice extractor not seperator. I have used the kenwood juice extractor in the past. Maby you can tell us a little more about yourself? Age hight waight, if you are fasting? I have stage 3 melanoma; have been fine for 6 years but now have soreness in my left underarm lymph. Tom in an email suggested I do 40 day juice fast; I am on day six mainly carrot and apple. Some ginger, turmeric and garlic. On previous fasts I have used a straightforward juice extractor like the Kenwood but recently I have been looking at the Gerson Therapy (same deal basically) but they do insist that a crush and press type juicer, specifically the Norwalk should be used as it preserves the enzymes. What do you think? I am 64, 5’11”, 15 stone, quite fit. I live in Venezuela. Learnt about diet and fasting at Forest Mere (now Champneys) in the UK which was started by my father. Tom has kindly invited me to come to spend some time with you while I do the fast. I want to but I have a business that needs my presence… at the moment at least. Tom also suggested I should take TumorX internal. I saw he says its painful in a comment to another site member. Is it very painful? Is the TumorX he refers to the TumorX Apoptosis Protocol on their website which includes TumorX 103X, and two types of bloodroot? What do you think? Alot of questions!! Sorry about that!! Questions are fine. That is why we are hear. Tumorx applied to and external tumor is very painful as it acts much like a chemical burn. Internally the dosage is much lower but it can cause stomach upset. The Norwalk juice extracts the best juice possible but the work and price tag are prohibitive. Organic using the system would be the ultimate juice. I always state the catabolsim is the greatest healing factor which explains why people heal using $20 juicers and chemically grown produce. Do what you can afford and trust in God for the rest. Hi. I am thinking of water fasting for 7-10 days. I am a 21 year old female. I am 5′3” and 140 lbs. I look fine though I am around 5-10 lbs overweight. I have been in a cycle of binge eating and starvation for the last few years. I have suffered from this eating disorder for too long and I feel that I have lost control of my own hunger. I have done multiple juice fasts and a 4 day water fast and I lost about 10 lbs. I think a water fast should clear out my system. My main concern is my metabolism. I know at this point I fall into the category of yo-yo dieters but I am young and wonder if I’ll ever be able to eat normally (1600-2000 healthy calories) after this. Fasting for 7-10 days is fine, its what you do after your fast that counts. Spiritual wisdom does come from a water fast of a lengthy period of time, 21-30 days. When the metabolism slows after fasting, you must counter this with an exercise program to speed it up. Your binge eating can be rectified by a long water fast. Diet maintenance is my biggest downfall after fasting . For 30 days I tryed a raw diet and lost 25 lbs and eat as much as I wanted but was strict on those 30 days my knees did not hurt and climbed us a rocky hill side in wyoming at above 7000ft felt great wounder now why I ever quit .